www.schlopstakovich.com :: View topic - What are you eating right now? Posted: Wed Jul 11, 2007 7:09 pm Post subject: What are you eating right now? I saw this thread idea on Something Awful a while back and thought it was lame. But I was thinking it might be cool to try it here and if anybody is eating something, then they can post about it as they're eating it. I am currently eating a big bowl of CARROTS!!! They are small and rounded, from a bag. But I doused them in water and now I am crunching on them. Just plain, no dressing. They're refreshing and juicy. And crunchy!!! Oh and if you put in a picture of what you're eating, that'd be cool too. Lee and I are eating a MINI PIZZA. It is our 8th one!! Lee puts it in the oven until it is crispy and then she cuts it into 4 mini-pieces. Then we let it cool and we EAT!! We're watching Buffy while we eat too... yay!! I really don't think it's a good idea, Nibs, to try to eat while doing other stuff like surfing on Schlop's site. I usually eat with both paws at the same time (like a chipmunk) to avoid any snack mishaps. That's cool you ate a Buffy Pizza Nibs! Usually I like to snack on some schlopcorn while watching Buffies. But sometimes I will get so engrossed with the show that I will forget the schlopcorn is even there! Posted: Mon Jul 16, 2007 7:42 pm Post subject: soup! Anysneech, I was posting because Lee and I just ate some Vegetable Medley Soup. It was from the Soup in a Box variety and it had some squash and other vegetables apparently mixed into a fine green liquid. It was yummy. We also made toast and ate them together! How about that! I'm glad Lee is back from the woods. Anyway, good luck with the Boca Burger out there you guys! It tastes a bit papery... Did Muffins forget to take it out of the plastic? Is that newspaper in there? I'll finish it - but that doesn't mean I like it! Posted: Tue Jul 24, 2007 11:28 am Post subject: Breakfast! Me and Lee are eating breakfast. We just opened a new box of oats, honey and raisins. It always tastes SO good when you eat the first bowl. Then it gets more stale and less tasty. I wonder why that is. Anysneech, it's really good now and Lee and I are really enjoying it! Right now I am eating a box of Pineapple Plenty from Schlops. It has pineapples and coconuts and raisins and banana chips and peanuts and walnuts and almonds and raisins. Hey Gulliver... you listed raisins twice in that description. Does that mean it had two scoops of raisins? I heard you got a chocolate sundae. Are you gonna eat all of it? Do you think I can have some of it if you don't finish? Posted: Mon Sep 19, 2016 10:18 am Post subject: Dibs? I saw there was a bowl with foil over it in the fridge and I started eating it. I didn't see anyone's name on it. Hopefully that is cool if I eat the rest. It is cauliflower and it is kinda salty but I like it. Posted: Sat Nov 12, 2016 12:17 pm Post subject: Pickles! I finally did it! I went to Pickles! After all these years of talking about it - it finally happened! 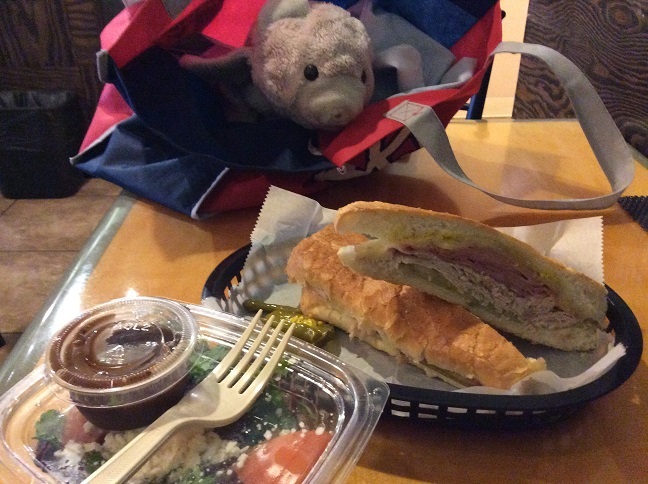 I got a cuban and a side salad! And yes, there were pickles on the cuban! Posted: Sun Dec 18, 2016 10:02 pm Post subject: Carrot cake! 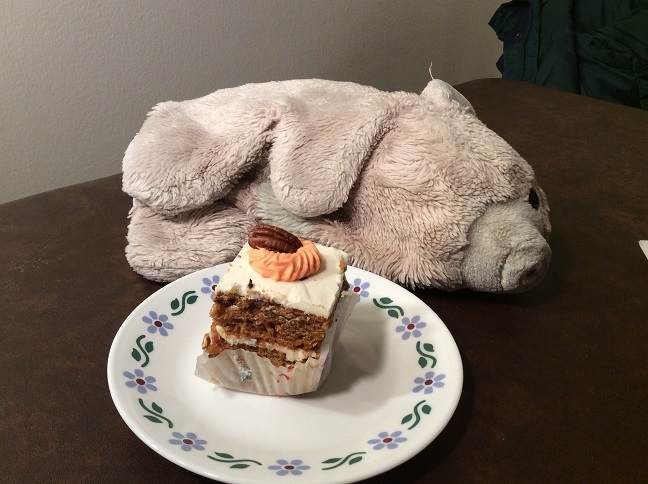 Look at this giant carrot cake I got for a dessert treat! I had a bite and then got sleepy!